Unless something very strange happens in the Brazilian Grand Prix later today it now looks certain that the Brawn F1 team will win both the Constructors’ and the Drivers’ Championship this season. It is the most remarkable, and in many ways pleasing, outcome in the history of the sport. Remarkable because before the season began nobody gave Brawn a prayer – not the experts, not the fans and certainly not the bookmakers. One preview by a long-in-the-tooth and distinguished writer about F1 said about Brawn that “…they must surely struggle near the back of the field” and The Guardian’s Maurice Hamilton predicted that Jenson Button would finish 14th in the championship and Rubens Barrichello 16th. The bookies agreed - Jenson was 66-1 and Rubens 125-1 to win the Drivers’ title and Brawn were 80-1 to win the Constructors’! The outcome is pleasing because in a sport not over-burdened with people at the top who you would admit to having as friends Ross Brawn has always been one of the good guys. I was reasonably close to Ferrari for a few years in the late 1990s and the early part of this decade. I visited Marenello and met all of the key players including the then team boss Jean Todt and the drivers – Schumacher, Irvine and Barrichello. It was a hugely impressive operation – Schumi was a genius (if a slightly flawed one), Todt a clever and calmly effective leader and Schumacher’s team-mates, first Eddie Irvine and then Rubens, were personable and rightly popular. But the guy I rated most highly was Ross Brawn who was Ferrari’s Technical Director. He was quiet, modest and articulate and when he spoke you listened – not just because he knew what he was talking about but because he seemed to be telling you the truth. My love affair with Ferrari was somewhat tarnished in 2002 when Todt ordered Barrichello to let Schumacher through to win the Austrian Grand Prix – the sort of gamesmanship that gives sport a bad name. I was at the race and Brawn was clearly uncomfortable with what had happened – although he kept his silence. Ross Brawn is a pleasing exception to the rule that F1 team bosses and the sport’s senior administrators have to have about as many morals as a tomcat on the prowl. So for Ross to triumph this year is truly a delight – and the same applies to whichever of Jenson or Rubens is crowned world champion. My patriotism favours Button, but my heart leans towards the veteran Rubens. He was the loyal number two at Ferrari and this was at times highly frustrating for him – as at the A-Ring in 2002. He has always had the talent to be World Champion, but aged 36 at the beginning of this season and with a drive in an unknown car the bookies weren’t far out in their assessment that it was the longest of long-shots. If Rubens wins today at his home Grand Prix in Sao Paulo, and Button and Vettell fail to score many, or even any, points (the likely outcome) then a fabulous fight to the finish between the two Brawn drivers in Abu Dhabi is a mouth-watering prospect. Whatever happens Ross Brawn has comprehensively upset the complacent Formula one applecart this year and shown that you don’t have to have giant corporate backers and sponsors with bottomless pockets to win in this most commercial of sports – and this surely pleases all of us whose Formula one memories go back to the days when it was possible for the private entrant like Raymond Mays, Tony Vandervell, Colin Chapman or Ken Tyrell to win. Division 2 cricket County Championship side Northamptonshire have been captained in 2009 by the South African Test cricketer Nicky Boje and with him in the side have been fellow Springboks Rike Wessels, Johannes van der Wath and Andrew Hall. In a recent article in The Guardian Mike Selvey suggests fairly unequivocally that England and Northamptonshire spin bowler Monty Panesar has been the victim of a “lack of respect” from the overseas players at the county (all of them South Africans) and he hints that this has been manifested by chats about Monty between these players in their common language - Afrikaans. These chats have been overheard by visiting South Africans from other counties. Now Selvey has his finely-tuned ear always to the ground when it comes to picking up the scuttlebutt in the world of cricket and I doubt that he would have reported the story unless he had pretty firm evidence that the gentle Monty’s difficult cricket year has not been helped by his being at times in an alien environment in his own county dressing room. The idea that in the once genteel environment of English County cricket, a place that over the years has welcomed players from all over the cricketing world, there is now the possibility of Afrikaner-speaking cliques demeaning fellow players is a pretty nasty thought. 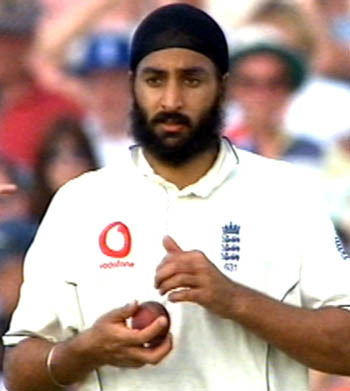 At Northants itself many of us will remember with pleasure the contribution that Panesar’s fellow Sikh, Bishan Singh Bedi, made for many years. Bedi was a popular figure at the County Ground in those distant days and he also had a foreign captain, the Pakistani Mustaq Mohammad for some of that time. It wouldn’t have happened in Mushie’s days, but perhaps times have changed and maybe it is now the smart thing to do when two or three Afrikaners are gathered together to put down a colleague. Possibly especially so if that colleague, like Monty, comes from a distinctly different background and wears a Patka.